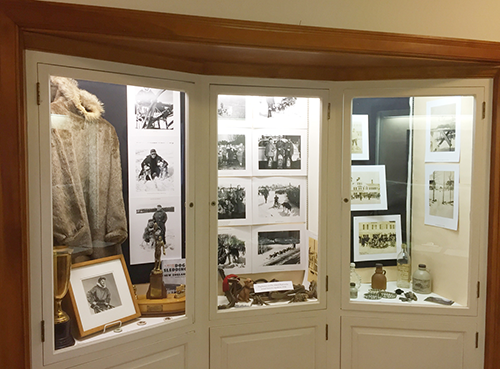 Jaffrey Historical Society exhibit on Dog Sledding & Winter Scenes in the display cases at the Civic Center. February, 2017. Photo credit: Rob Stephenson. Jaffrey is a town situated in Cheshire County in the southwest corner of New Hampshire about 70 miles from Boston. It was first settled in the 1750s and incorporated in 1773. Named for the Portsmouth merchant George Jaffrey—who never visited the town named for him—it is said to be the only Jaffrey in the world. A diverse community of nearly 6,000 people, Jaffrey has a rich and interesting history which is the focus of this website. 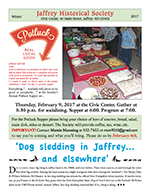 Our motive in developing it is to bring together multiple historical resources pertaining to Jaffrey and by doing so make the history of our town more accessible to students, researchers, historians, geneologists, property owners, public officials, businesses and institutions—in Jaffrey and further afield. A selection of photos from past meetings and programs can now be found on the Jaffrey Historical Society's SmugMug site. Photo of a Conant High School graduation by Steve Hooper. Steve gave a talk to the JHS about his photography in 2012. Rob Stephenson has a page devoted to the Meetinghouse Roof Replacement project. You can find his day-by-day photos of the project on his Smugmug site. A variety of Jaffrey Historical Society publications, in addition to other public domain titles, can be found in the links of our publicatioins page. There is a large collection of historical maps available for download on the maps page. Please note: All images are the property of the artists and cannot be used without permission.